The Gorilla Organization has been involved in a range of initiatives over more than two decades. Some projects reach a natural end, while others are discontinued or out on hiatus for many reasons from a lack of funding or participants or a change in the political background. The Gorilla Organization has been involved in many initiatives over more than two decades. Our community-based approach enables the organisation to provide a flexible response to the needs raised by our teams working in the field. Supporting Ugandan rangers: Working with the Uganda Wildlife Authority, in 2008 we provided water tanks at the Mgahinga Gorilla National Park ranger patrol post; we funded the repair of the stone wall that borders the national park, separating the gorilla habitat from the surrounding park land; and provided a power saw, which is facilitates the removal of invasive, non-native plant species. 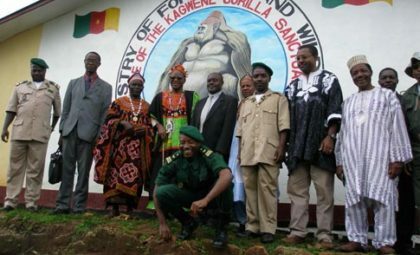 Supporting Rwandan rangers: The Rwandan government now funds its own rangers to protect the gorillas and guide tourists in the Volcanoes National Park, but The Gorilla Organization has continued to work with the Rwandan Office for Tourism and National Parks (ORTPN). From 2004-2008 the organisation purchased some basic equipment for ORTPN veterinary centre, provided computers and a digital camera, which help the rangers record and analyse vital information about the gorilla groups, and supplied a four-wheel drive vehicle, which enables the rangers to spend more time monitoring and protecting the gorillas. 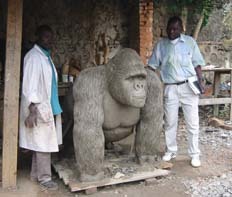 Support for local Rwandan artists: The Gorilla Organization partnered with Magasin Equatorial des Arts (MEA) in 1997 to promote the production of environmentally-themed works of art and handicrafts, which not only raise awareness on the gorillas and their habitat, but also help to generate profit through sales. The project also involves a youth training scheme, which supports orphans through training in art and craft production, and in 2006 MEA were supported to continue this. To date, 43 youths have completed the training programme and 15 have enrolled to become full-time members of MEA. Water Collection in Rwanda: In 2000, The Gorilla Organization partnered with ARASI (Association Rwandaise pour l’Amenagement et le Sauvegarde des Infrastructures Socio-economiques) to build water cisterns in the communities surrounding the Volcanoes National Park. Over several years, the partnership constructed 40 water cisterns, providing water for more than 40,000 people. Microcredit around Virunga National Park, DRC: The Gorilla Organization began working with local partner PAIDEK (Programme d’Appui aux initiatives de Developpement Economique du Kivu) in 1999 to establish a microcredit project called “Tujitegemee”, from the Swahili for self-reliance. By the end of 2004, the project had become more-or-less self-financing, but was interrupted by several periods of intense fighting which saw clients businesses looted and destroyed. It was re-financed in 2007 and was expanded in 2009, by which time more than 153 groups were benefiting from loans, and since the project started more than of 1,122 individuals in 310 groups had benefited. Fuel-efficient stoves around Virunga National Park, DRC: The collection of firewood and charcoal is a major source of deforestation, with militias controlling the charcoal trade, children often waste employed to collect wood, and traditional stoves producing noxious smoke. The fuel-efficient stoves project was launched in partnership with local NGO AIDE-Kivu (Appui aux Initiatives de Développement et Gestion de l’Environnement au Kivu) in January 2008, and has since been producing and distributing ‘Jiko’ stoves, which reduce the consumption of firewood and charcoal by at least 55%. Thousands of stoves were distributed to forest neighbour communities and sold in cities, and the project was shortlisted for the World Challenge 2009. 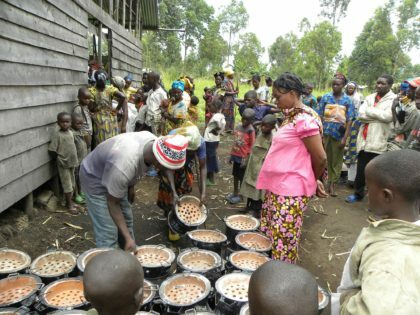 In 2011, the project was boosted by the Body Shop Foundation for a year, with a further 1,500 stoves produced, of which 200 were sold and the rest distributed free to selected communities in North Kivu. Western Lowland Gorilla Conservation: During 2008, Gorilla Organization staff travelled to Gabon where they conducted a needs analysis on the western lowland gorilla population of the Moukalaba-Doudou National Park and the surrounding communities, due to growing concern over the decline in numbers of this once-widespread subspecies. The Gorilla Organization is now looking to build on the success it has had in Uganda, Rwanda and DR Congo through the implementation of a community conservation programme as and when funds become available. Cross River Gorilla Project: The Cross River gorilla is the most critically endangered ape in Africa, with fewer than 300 individuals remaining on the Nigeria-Cameroon border. Populations are spread across an area of just 12,000km² and are primarily threatened by hunting and habitat destruction resulting from human pressure. To secure the future of these apes, the Gorilla Organization partnered with the Wildlife Conservation Society (WCS) in 2007, pledging financial support to facilitate development of the Kagwene Gorilla Sanctuary, Cameroon, through the Cross River Gorilla Project. In 2008, the sanctuary was gazetted, offering it legal protection for the first time. It has also secured the support of a warden and two rangers, significantly reducing illegal activities such as trapping and farming. The installation of a solar power system eased the use of computer equipment and facilitated training in basic IT skills, enabling staff to input field data on site.